Dear ones, SaLuSa asked me to leave this song down to be heard at the time of reading. I recommend that you read the message aloud while the background music plays. As you are increasingly immersed in the intense processes of liberation and settlement of the new energies that have come to Earth, we are continually expanding our field of action, directing members of our fleets to park in the Earth's lower orbits, so that come to scare or cause any disorder. Our first intention is to prepare the energy field for our arrival, as we have received, with each new cycle of our actions, instructions from the main mentors of this Project, that you are reaching levels of possible direct contact. So we have to prepare the energetic environment at first, so that their biological bodies adapt to the high frequencies of our ships. As we have said, the continuous observation of our ships visualized through the camouflage (Cloud-Ships) is a sign that we are following these approach protocols. Of course, some of you may have something to wonder about whether, in fact, many of the discoid clouds are really our manifestations, or just simple coincidences. Dear Ones, no other time in your history has there been as much movement in your skies as in the present day, and even the most skeptical feels that somehow "there is something different in the air." Many of you who deal with land, agronomists, and / or any other professionals who are accustomed to this area of ​​work will begin to notice "strange" things happening. Mother Earth is in the process of cleansing her body in general, and also cleaning it of the impurities accumulated over eras. Infertile land for planting will begin to enter into a state of purification. Demineralized soils will begin to balance, and in all these movements, you may begin to see the birth of something that until then was not possible in certain places. Know that you can also help in the process by speeding up this purification so as to ensure a better work with the soil. Gaia wishes, as always, to be cooperative with all, but also hopes that, especially at this moment, support it a little more in this process so intense and so necessary that it is happening. Gaia sent a clear signal to the Creator who is ready and willing to do anything to help everyone in the process of Ascension. So, have no doubt she will do anything to support you. In addition, you will be entering a colder phase of your Planet. The energies that have been directed directly from the Central Sun of the Galaxy have adjusted some things on Earth and this will lead to a small general cooling. But do not be frightened by this, for everything is already within the plan and there is nothing to fear. You have also received this information from other sources, and we are just confirming it. In the midst of this whole process of Mother Earth, the Pacific Ocean is undergoing its transformations, and those who navigate through that zone are increasingly perceiving "strange lights" entering and leaving the water as never before. Plunged into the depths, bases of the Galactic Federation are being reactivated at this time, and great agitation is occurring. Portals outside the Galaxy are being reactivated. It is a direct request from the beings called "The Guardians" who have recently arrived with us. These Portals will give greater access to the physicality of the Earth and that is where many beings coming from other galaxies will come to give direct assistance to the process. These portals are very powerful and have been very active in MU times. In addition, dry portions will begin to emerge "
You will begin to feel more the presence of your Guardian Angels, for they have come closer to support you even more in your processes. Immense Legions of Angels are coming from the 13th and 16th Dimensions and shaping their bodies in the fields of the Earth. Some people have seen intense bundles of Light ripping the skies toward Earth as if they were meteors. And even pillars of Light are also being observed. These events, in the majority of the cases, have been given by the descents, in mass, of these angelic beings. Keep in mind that everything is going very well. And those who do not want progress continue to come out of their realities, for the simple fact that they are no longer compatible with the current high levels of consciousness of the Planet. 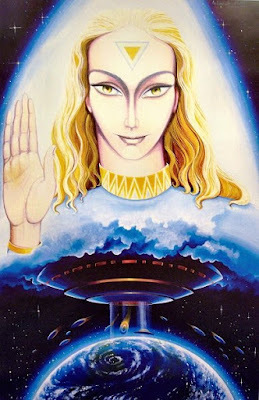 The Ashtar Command is very active in these times and ensuring the safety of their skies continually so that no more invaders from outside the Planet will undermine their trajectory of return to their full state of consciousness. Beloved ones, nothing else will stop or delay your momentum forward. Although apparent delays have plagued their being, know that the so-called "delays" for many of us can be considered as "strategy", since we are acting in a puzzle game and all the pieces need to be well fit together harmoniously. I am SaLuSa, from Sirius and I am once again very honored to be the spokesman for the Galactic Federation, at this time, ensuring that the information can arrive through this source dearly loved by us (Gabriel RL) and / or by any another in the service of the Federation. We are sure that nothing will interrupt our advance and your expansion of consciousness. Always remember: you did not go to earth to atone for karma; you were to accelerate your personal processes of expansion, for the Earth gave you a considerable range of tools that would leverage your expanding consciousness and Light. And all this together and in the midst of all experiences and energies - which you call karma - that were generated, and there was a need for its rebalancing.Thus, you, as ethical and correct beings that you are, they would never leave the Earth without finalizing all their processes and balancing everything that would fit this need. Therefore, see karma not as a punishment, but as an ethical and necessary fulfillment for balance in your particular universe and in one whole. Be in Peace, Be in the Light! Gabriel RL: Very grateful, beloved SaLuSa! Thank you Salusa, Galactic Federation, Guardian Angels, Archangels & Legions of Angels for aiding in Mother Gaia's cleansing endeavor. Welcome to the Guardians for their assistance, and to the Ashtar Command for ensuring safety for all. In Love, Light & Peace, Namaste.